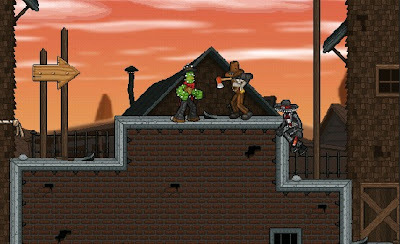 Cactus McCoy is a new platform brawler flash game developed by Flipline Studios. It all started with a routine treasure hunt that goes awry and McCoy is transformed into a walking catus man by the power of the ancient curse casted upon him by a thorned emerald. Explore wild west world filled with rutless outlaws and secret treasures. Weild a huge variety of weapons being dropped by downed enemies. Run, jump and punch your way through army of enemigos sent by the monstrous Hex Hatfield. The game offers long hours of gameplay and many features like time trials, 60 area challenge and over 80 badges to earn. Anyways, here is the first video Cactus McCoy walkthrough (the rest up next).